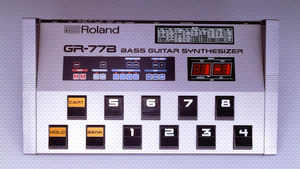 KitMonsters – Roland G-77 Bass Guitar Controller. The music makers’ guide to making music. 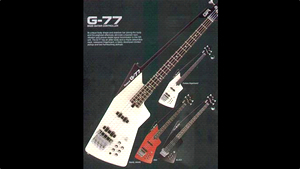 The G-77 Bass Guitar Controller was only made for a few years and is quite rare. The bass has an unusual stabiliser bar and plugs into the chunky GR-77B bass guitar synthesizer. The synth part has a memory bank that can store 64 sounds and an extra 32 in special memory cartridges. It is is based on keyboard models used by classic 80s bands such as The Human League and has 4 voices, and is popular with artists such as Neon Indian.